Verification testing answers this question. For copper cabling, these simple-to-use, low cost tools perform basic continuity functions such as wire map and toning. Wire mapping will tell you that each pair is connected to the right pins at plugs and jacks with good contacts in the terminations, while toning is used to help identify a specific cable in a bundle or at the remote end. Some verification testers like Fluke Networks' MicroScanner2 Cable Verifier include a Time Domain Reflectometer (TDR) feature to help determine the distance to the end of a cable or a trouble spot. It can also detect if a switch is connected to the cable under test. For fiber, a simple Visual Fault Locator (VFL) can serve as a verification tool as it verifies continuous fiber connections to help find breaks, connectors and splices. It also verifies the proper polarity and orientation of fibers within a multi-fiber connectors. While verification is ideal for troubleshooting and really the first line of defense in finding cabling problems, most cable testing requires more than simple verification. Hence it is rarely the only method used--unless testing POTS (plain old telephone service) voice-only applications running over simple voice-grade cable like Category 3. Verification testing alone will not verify the ability of the cabling to support specific applications. And it certainly won't result in the ability to ensure the standards compliance required for a manufacturer warranty. Can the Cabling Support the Desired Application? Qualification testers include verification functionality but are more sophisticated with their ability to qualify cabling bandwidth. Qualification provides the information needed to determine if the cabling under test will support the signaling of specific applications. For example, if you have two cables that pass verification testing, Fluke Networks' CableIQ™ Qualification Tester might also show that only one of the cables can support 10BASE-T (i.e. 10 Mbps Ethernet) while the other can support 1000BASE-T (gigabit Ethernet). 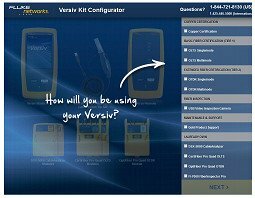 Combined with verification functionality, qualification testers are also excellent troubleshooting tools. They are ideal for small adds, moves, and changes, or for setting up a temporary network that needs to be qualified for a specific network technology. They can also help in deciding whether an existing cabling plant needs to be upgraded to support a new application. But like verification testing, qualification does not perform the certification required by cabling manufacturers. Does the Cabling Comply with Industry Standards? Certification testers are the only answer to this question. Used by commercial installers/contractors and enterprise facility managers to ensure that new cabling fully meets the requirements of cabling standards such as TIA-568-C.2 Category 6A or ISO 11801 2nd Edition Class EA, certification is the most rigorous of all cable testing. It is required by cabling manufacturers to receive a warranty. Certification includes all the testing that goes into verification and qualification, but also makes several measurements across predefined frequency ranges and compares the detailed results to standards set by TIA or ISO. The results determine Pass or Fail in accordance with the standard and indicate if a link is compliant with a specific category or Class of cable such as category 6A or EA. This in turn tells you which application it is able to support. While the decision to use verification, qualification or certification testing ultimately comes down to what your customer requires, the bottom line is this: If you want the support and financial security offered by a cable manufacturer warranty, certification to industry standards with tester such as the DSX CableAnalyzer™ is your only option. Anything else puts the sole warranty responsibility upon you. And with an average cost-per-link of at least $100 for a commercial installation, the dollars at risk are huge. Поддерживает ли моя текущая кабельная система стандарт 2.5/5GBASE-T? Рекомендации по маркировке кабелей, Circa 2017 г.
Что там с промышленным Ethernet? Серия 101: Что такое разъем APC и как его тестировать? Тестирование кабелей 101: Но в стандарте указано 0.75 дБ!